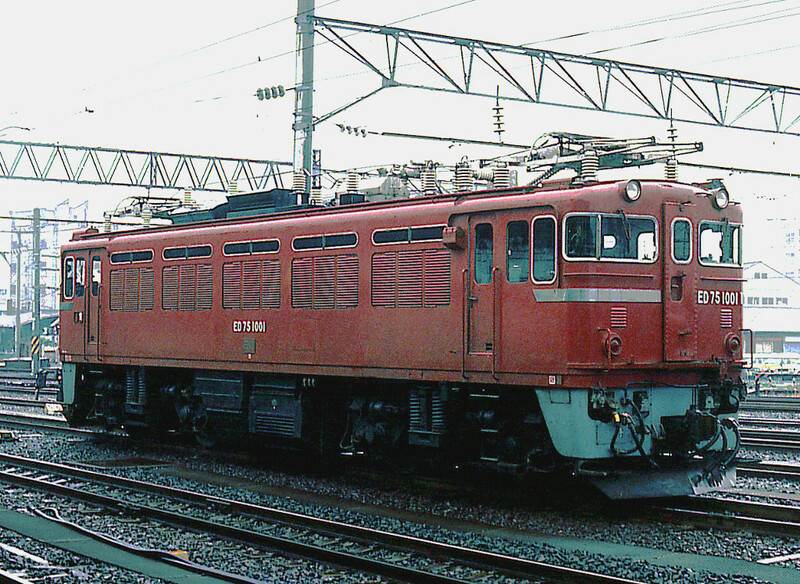 According to Wikipedia, the ED75-1000 series consisted of thirty-nine AC electric locomotives, numbered 1001-1039, manufactured during 1968 -1976 for the Japanese National Railway (JNR). These locomotives were intended for high speed freight trains and for express trains of Series 20 sleeping cars, but there is photo evidence of some also working in less prestigious assignments such as towing branch line freights and Series 50 coaches. After JNR was privatized in 1987, it's successor the JR group used these locomotives in freight service for many years before replacing them with newer electrics such as the EH500. I don't know whether any locomotives from the 1000 series remain in service or have been preserved in operating condition. The N-scale model reviewed here is described as an "early" ED75-1000 by Kato, presumably meaning as it appeared when built for JNR, and lacking the later "JR" logo. The model was released in late 2014 with a list price of 6,800 Yen, but as usual for the hobby market, online retailers in Japan discounted the list price. Unfortunately, because the model is now sold out at the factory, retailers with stock may be hard to find, leaving eBay as the most likely source. However, a similar Kato locomotive, ED75-700, was released in late 2016 and should still be widely available. One of the linked blogs compares the two models. Number plates (1004, 1008, 1011, and 1014) for modeling four of the thirty-nine locomotives in the ED75-1000 series. I chose to model ED75-1004. Maker plates for Hitachi (日立) and Toshiba. Head marks for two special passenger trains ( Yuuzuru and Akebono) to be placed on the locomotive's nose to identify the train. Jumper cable plugs for multi-unit operation with two or more locomotives. Optional Kato knuckle couplers as replacements for the Arnold (Rapido) couplers that come installed on the model. All details except couplers must be removed from sprues, and being very small, these details can easily be lost in the process. I placed masking tape against each sprue to hold or catch details while cutting them off with a single-edged razor blade. The number plates, maker plates, and jumper cables have nubs that plug into pre-formed slots or holes on the locomotive body. I had to cut carefully to avoid removing the the nubs. Tweezers helped position the number and maker plates in the preformed slots. Once positioned correctly, these small parts will snap into place when pushed. I applied pressure with my finger, but used a Q-tip instead where a fingernail could cause damage. Gluing seemed unnecessary, but time will tell. I don't like using glue where it might run or ooze out and leave unsightly traces. The head marks hold in place magnetically, a nice feature, allowing you to easily change them. Only one end of the model receives a jumper cable. The cable's ends need to be pressed into tiny preformed holes barely visible to the naked eye, and the springiness of the cable adds to the difficulty. I installed it using tweezer nosed pliers with the aid of a magnifying glass. The cable had not been installed when the photos here were made. I installed a Kato knuckle coupler on one end of the locomotive to give it a more realistic appearance, but left the Arnold coupler on the other end because all my freight cars have Arnolds. am impressed with the quality of the ED75-100. It is well designed and well made. I can't think of much I would add or change. Instructions in English would be a welcomed addition, and it would be nice if the jumper cables came already installed or were made easier to install. Other details, however, were not difficult to add, and switching couplers was easy. Not having plans that give the prototype's dimensions, I can't evaluate the model's dimensional accuracy, but it compares favorably with photos, and the color looks right. Nor do I have equipment to measure running performance. I am, however, pleased with how smoothly it runs and how well it pulls. Note: The locomotive is not sound equipped.The train sounds in the above video are from an external source.